Home / Blog / SOAP – Is it time to ditch the bottle? SOAP – Is it time to ditch the bottle? Over the years the humble bar of soap has become increasingly less popular. Since the introduction of the pump dispensed hand wash in the 1980’s, the soap bar has been viewed as a less convenient and even a less hygienic way to get the hands clean. But is that true? Ok, so as a maker of bar soap, it could be said that I’m a little bit biased on this subject, but hear me out. Whilst I can see that having the soap in a handy dispenser may be easier to use. I’m not entirely convinced that is it more hygienic? So let’s take a look at the facts? Way back in 1988 a study was conducted to determine whether or not bar soap was unhygienic. And it found that “washing with contaminated bar soap is unlikely to transfer bacteria”. That’s good to know! So why do people still believe that it can? Presumably it’s because the soap is being touched directly with contaminated hands, usually after using the loo. So it would be reasonable to assume that undesirable germs were being transferred directly to the soap. However, the very action of washing itself then goes on to remove the germs, rinsing them away down the plughole. Problem solved! The soap is then returned to the soap dish, cleansed of all germs by the end of the washing process. Hence, the findings of the study, that it is unlikely for bacteria to be transferred. But what about the liquid soap dispenser, could the same be said? After all one has to use a possibly contaminated hand to operate the pump dispenser. How many people will go to the trouble of cleaning the pump nozzle after each use? My guess is very few. So it seems more likely that the bottle soap, would be the least hygienic option. However, maybe you’re still not convinced. So let’s look at some of the other great reasons to return to bar soap. Liquid soap comes packaged in a plastic bottle and we all know what that means. It’s bad for the environment! Whereas, our handmade bar soaps are wrapped only in fully recyclable card. Bar soap needs no preservative, but liquid soap most definitely does. 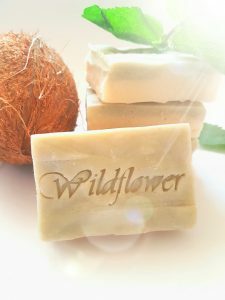 So bar soap is likely to be a more natural product. Some people believe that bar soaps are too harsh for the skin but not all bar soaps are made equal. 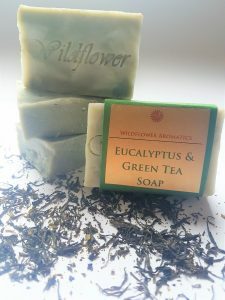 We use good quality plant oils and butters to make our soaps. Including Shea butter, Coconut Oil & Olive Oil. Plus many other skin loving ingredients such as Oatmeal, Clays and Milks. So perhaps the only advantage, pump dispenser hand soap has over bar soap after all, is convenience. Which I realise can be a big factor for some. And ok, so bar soap is slippery, there’s admittedly not much can be done about that. (Unless we revisit the soap on a rope idea!). 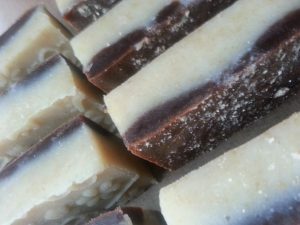 But if you value, the environment, hygiene and natural products over convenience, here are a few tips, to make using bar soap a more convenient experience. Don’t leave the soap sitting in a puddle of water. This will make it soft and slimy! Use a good soap dish, which completely drains and doesn’t allow the soap to sit in water. I have found the best soap dishes are the ones with open bottoms or sides, which let the moisture drain away.